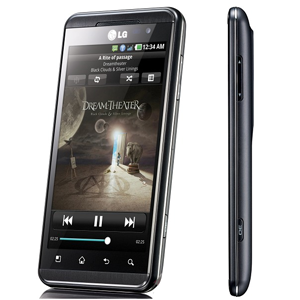 The LG Optimus 3D is the first mobile phone to feature a 3D display that does not require the use of glasses to experience the 3D effect. The 3D effect is created by using a parallax barrier screen. Using two rear cameras, the phone is capable of filming 720p video in 3D and 1080p video in 2D. The LG Thrill 4G comes with many applications that have been enhanced to display in 3D. There is a button on the side of the phone that allows users to switch between 2D and 3D instantly. Using the 3D effect drains the battery faster than using the LG Thrill 4G in 2D mode.